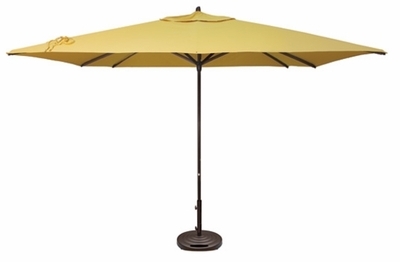 Put a little shade on the situation with the Treasure Garden 11' x 11' Easy Track Square outdoor umbrella. With its superb revolutionary innovation, this patio umbrella has no crank or cord and operates with the simple turn of a knob. The sizable 11' x 11' ft. canopy offers a substantial amount of coverage from the harsh sun. The powder coated aluminum pole is both sturdy and durable and will withstand the outdoor elements without the worry of rust or corrosion. Add a splash of color to your open-air space with the wide selection of premium Sunbrella or Obravia fabrics that are fade resistant, ensuring their beauty from season to season. Add this outdoor umbrella to your patio space to delight your guests with its functionality and refined appeal. * Shade Size: 11' x 11' ft.
* Weight: SWV: 44.0 lbs.